Lost and broken, Celaena Sardothien's only thought is to avenge the savage death of her dearest friend: as the King of Adarlan's Assassin, she is bound to serve this tyrant, but he will pay for what he did. Any hope Celaena has of destroying the king lies in answers to be found in Wendlyn. Sacrificing his future, Chaol, the Caption of the King's Guard, has sent Celaena there to protect her, but her darkest demons lay in that same place. If she can overcome them, she will be Adarlan's biggest threat- and his own toughest enemy. While Celaena learns of her true destiny, and the eyes of Erilea are on Wendlyn, a brutal and beastly force is preparing to take to the skies. Will Celaena find her strength not only to win her own battles, but to fight a war that could put her loyalties to her own people against those she has grown to love? Something really heartbreaking happened during the duration of me reading this book. At first I thought it was just a fluke of some sort or that I was really in a book slump. I found that I really couldn't get into Heir of Fire. A few reasons might be because of all the information that was just thrust onto the readers. 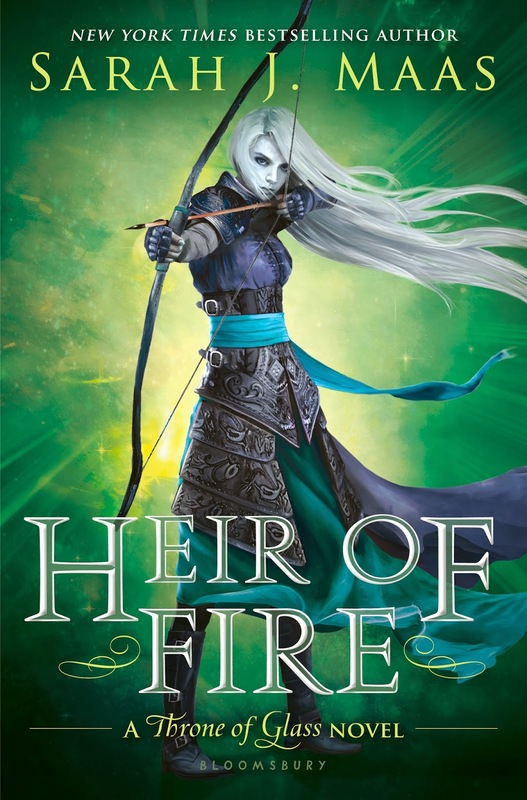 SO SO MANY new things come into play in Heir of Fire, and I really couldn't keep up with it! There were a bunch of new characters that were introduced in this book, and I really didn't like any of them. There was Rowan, who was supposed to be a close cousin of Celaena's, but ended up acting like a total douchebag. He was even worse than Chaol!! We were also introduced to an entirely new perspective from a witch, Manon Blackbeak. She was, for a lack of a better term, really annoying and just so vain. Her character was very arrogant, thinking she was the most ruthless and powerful witch that could control wyverns (dangerous beasts). 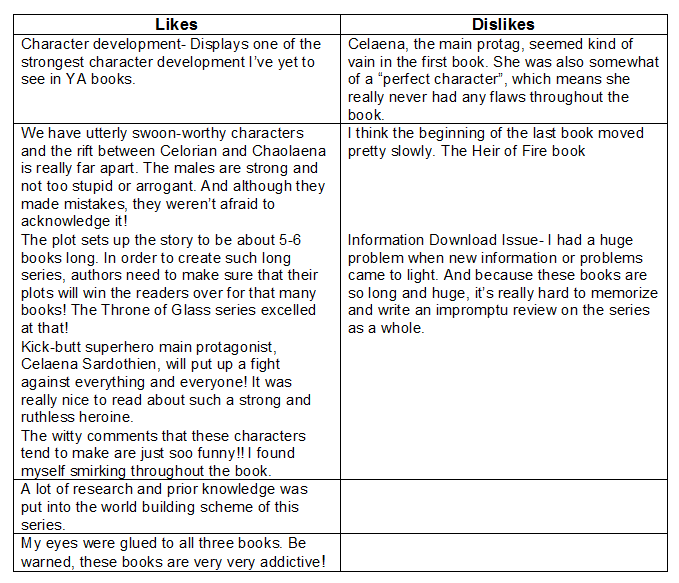 I liked the aspect of having different point of views presented in the book though. I was too busy being upset with the old characters in the book like Dorian, Chaol and, of course, the damned King! Dorian was flirting with a healer and Chaol was just such a disappointing character to read through the book. It's like does he love her, or does he not? It really wasn't a difficult question, but apparently Chaol couldn't find the answer. At times, I found it so frustrating to get through these certain parts in the book and that's probably why it took me so long to finish this book. There was just so much going on in this book that I felt like my head was going to explode soon. That was a bit too much on the dramatic side but I felt like Sarah J. Maas should have let the information out in bigger increments rather than dumping them in most of the already cluttered chapters. Surprisingly, I wasn't all convinced that this book was all about Fae. We barely got to the see the actual "Fae" other than hearing Rowan and Celaena shifting during practice and training. It was so so very sad. *sad face* If you haven't started this series, it's definitely worth a try. It's currently ranking as one of my favorite series of the year 2014!! Chaol! I just... WHY?! YOU LOVE CELAENA! Got it? Okay, good. I can't wait for TOG #4! And I can't wait to read your thoughts on the first book! BTW LOVE THE NEW BLOG DESIGN!!! I have to read this series! Looks so good. Ohh I'm sorry if I spoiled anything for you, I have a tendency of doing that. But please, by all means enjoy the last book when you read it! It's great that you're reading books in other languages, which is something I can't do to say the least! Awww I love the book too!! LOL Yes I really like how Celaena let her guard down. I was SOOOOOO mad a Chaol! Like, seriously, dude! You love her. You should still love her for who she is! I just wanted to smack him. Great review and blog! You've got a new follower!